It has been said that the World Cup has only been won single handedly twice, Garrincha for Brazil in 1962 and Diego Maradona for Argentina in 1986. In Maradona's case the word singlehandedly takes on a more literal meaning though as England find out to their great cost. The relationship between the United Kingdom, or England specifically, and Argentina has historically been a strained one. The conflict between the two nations, that are separated by thousands of miles, stems from a disputed claim over the British territory of the Falklands Islands which is only 300 miles off of the coast of Argentina. In 1982, Argentina's military regime seized the Falklands, that they refer to as Malvinas, under the ludicrous assumption that the British would not respond militarily. The UK did of course respond, and the resulting ten week war left nearly seven hundred Argentine's dead and scores more injured. The resulting fallout would see Argentina's government fall the following year. It was under this politically charged climate that Argentina would face England in the Quarter-Finals of the 1986 World Cup in Mexico. 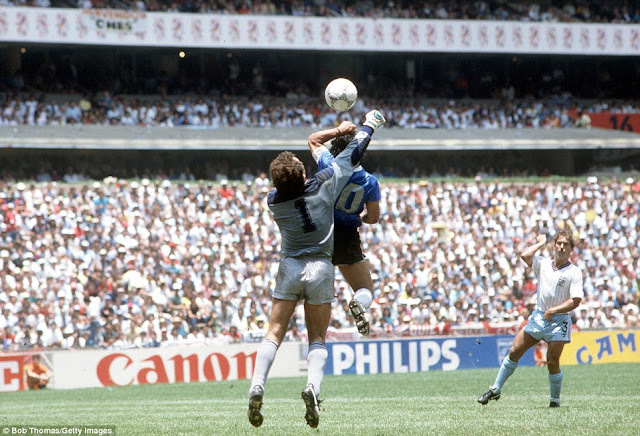 With the match evenly poised, Argentina's genius would turn cheating villain, when a mis-hit back pass towards Peter Shilton was punched over the keeper's outstretched hands and into the net by Maradona. Maradona would shortly after dribble through a dazed English midfield and backline to score one of the greatest goals in tournament history. Argentina would win the match 2-1 on their way to being crowned World Cup champions a week later. Whether or not England would have beaten Argentina without Diego's bit of trickery is open to question. 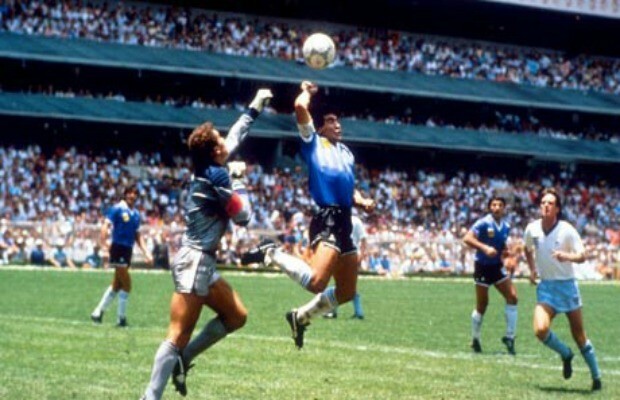 Following the match when Argentina's captain was questioned about his handball he responded that the goal was a little bit of Maradona, a little bit of the hand of god.